How to keep big bass once they’re hooked. Big bass are rare. For many anglers, hooking up with a giant bass is often a once-in-a-lifetime experience. Understandably, few things hurt as much as hooking a big fish and then losing it. In order to reduce the chances of lost fish, practice the following advice and you’re sure to reduce the odds of losing your next trophy fish. Upon hook set, it’s critical to immediately turn the bass upward when fishing in and around cover. In thick hydrilla or timber, it’s important to get the fish heading toward the surface. The proper technique is to use both rod and reel, pumping the rod and cranking the reel. If the fish has stopped coming up, maintain consistent pressure and go to the fish. Anglers shouldn’t engage the bass in a tug-of-war when it’s in thick cover. Doing so inevitably pulls the fish tightly against the cover and provides it with the leverage it needs to tear the hook free. Often, if you maintain light, consistent pressure, the bass will swim out of the cover on its own or grow tired. After the fish has been worked away from the cover, use the electric trolling motor to move the boat and fish over deeper water. Understandably, this may be impossible to accomplish when fishing shallow areas with plentiful cover. Still, it’s a good idea to learn how the boat’s position may help or hinder efforts to land big fish. Good boat positioning begins before the cast is ever made. Most bass instinctively seek deeper water, not cover, when threatened. Because of this, it’s important to position the boat so that the fish has a clear path out and away from the cover. After moving the bass over deeper water and away from cover, allow the fish to tire itself before bringing it to the boat. Many anglers fail to adjust their reel’s drag while fighting fish. Set a drag at the beginning of the fight, when the bass is a good distance from the boat. The drag will help wear the fish down, while the rod and line absorb the shock of a hard run. However, when the fish nears the boat and appears ready to land, reduce the drag setting. While fighting the fish, use the rod to absorb headshakes, jumps, sounds and runs at the boat. Don’t make the mistake of dropping the rod tip or placing the rod into the water in hopes of preventing the fish from coming up to the surface. By keeping the rod tip high, anglers are able to keep the line taut and prevent unwanted slack. 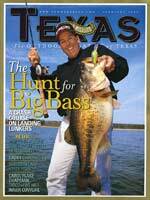 Big bass are often caught on big, heavy baits. When a fish jumps, slack in the line usually results in a thrown lure. It’s critically important to allow the rod to do its job of absorbing pressure, collecting slack and fighting the fish. At all costs, avoid constantly changing the angle of resistance. One of the biggest mistakes anglers make is continuously changing the angle of applied pressure in an effort to tire a fish. When sweeping a rod back and forth, the angler is working the hook back and forth, tearing the hole wider. A bigger hole typically results in a hook working free. The thing to always remember is, bass often inhale a bait. Every time an angler sweeps their rod to lead the fish in a different direction, they risk raking the line across the bass’ teeth. It’s similar to rubbing the line against a coarse-grade sandpaper — eventually the line frays or breaks and the fish is lost. Finally, there’s nothing wrong with using a net to land a big fish, but many anglers try to “net” the fish — that is, they stab, swipe and fling the net at the bass. The fish needs to be gently led over to the waiting net. Never try to drag or lift the bass into the net. Out of the water, the bass’ body weight can tear a hook free.